The purpose of the Hosanna online directory is to help build connections among Hosanna members (in bold in the directory), former members, and regular visitors. To protect everyone's privacy, you are able to log in and see the photos and data of other people connected to the Hosanna family only if your information (including an e-mail address) is in the Hosanna Directory. If you are not in the directory yet or need your data changed, contact the church office or Nancy Agafitei. If you are in the directory, click on this Photo Directory link. If you have not already done so, you must create your own individual password to access the directory. Click on the link for "Create a Login Now" at the bottom of the sign-in box. You will be sent an e-mail that lets you create your own password to access the directory. For future log-ins, just use your own e-mail and the password you created to get in. If you have created a password for the directory already but forgotten it, click on the "Forgot Password?" link and follow the instructions. SPECIAL FEATURE!!! There is now an app available for the directory for Apple and Android smart phones, iPads, and Kindle tablets. 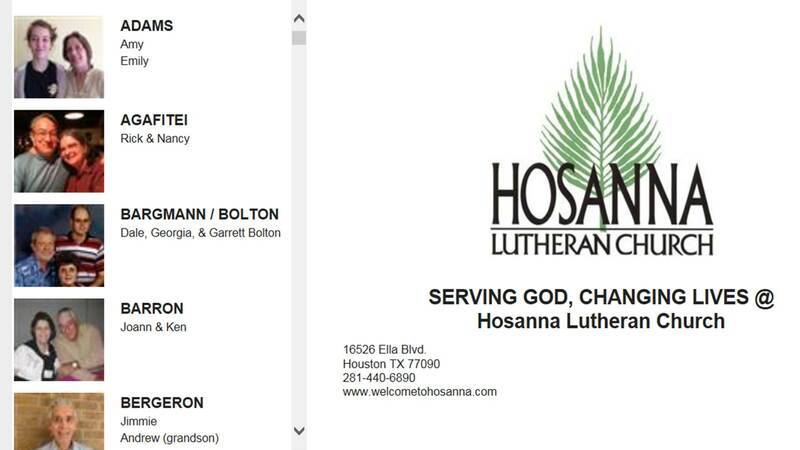 It is available to anyone who has an e-mail address listed in the Hosanna online directory. To get it, go to www.instantchurchdirectory.com/app . Scroll down and follow the directions to download and activate the app for your device. Once activated, no password will be needed to access the directory on your device.